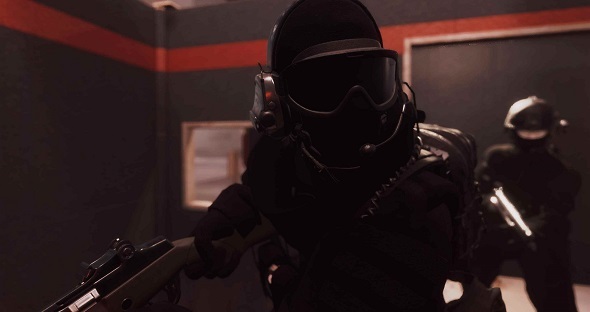 It’s been more than a year since the announcement of Ready Or Not, Void Interactive’s upcoming tactical FPS about SWAT operators in a vaguely dystopian near future. While announcements have been slow in coming, work on the game is still underway, and it appears as though the developers have been taking some guidance from recent shooters to help shape the course of their game. We’ve collected our favorite cop games in this list of the best police games on PC. In the most recent devblog, Void explain some of the systems they’ve been working on adding to Ready Or Not. There’s a clear emphasis on weapons realism, and the developers say they’re modeling all their weapon animations in 240 frames per second, much the way Tripwire rigged the firearms in Killing Floor 2. Weapons shake and rattle as they’re fired, and rounds will impact or ricochet depending on their caliber and the nature of the surfaces they strike. If a SWAT-themed tactics game sounds a bit like Rainbow Six Siege, well, you’re not far off the mark. However, Ready Or Not will include single-player missions and give you command of four AI-controlled SWAT officers. You’ll be able to assign officers to Red and Blue go-codes, having teams designated for breaching or clearing rooms, or presumably entering from different approaches. A tactical planning phase will precede each mission, reminiscent of the original Rainbow Six games and Sierra’s SWAT series. But technology has come a long way in the 20 years since those games were released, and Void have added a very sophisticated – and be warned, it’s graphic – gore system to Ready Or Not, and bullets will create exit wounds and cause trauma on their way through bodies. Your officers will suffer performance penalties if they’re injured, for instance, shots to the leg will keep them from being able to run. There’s an astonishing amount of detail being given to weapons, and your situational awareness will have to include checking magazines for ammo counts, similar to how it’s handled in Escape from Tarkov. It all sounds pretty promising, but there’s clearly still quite a lot to do. Void has put out an open casting call for voice actors, and you can submit an audition through Casting Call Club. There’s no set release date for Ready Or Not, but in the meantime, you can stay up to date on the project over on Void’s official site, or by following the studio on Twitter.